The grips on your scooter handle bar are one of the most important parts if we talk about your connection to your scooter. Blunt aimed at giving you the best possible riding experience, with the new V2 hand grips they definitely did. The new reinforced grips have some features that are really thought out. The new length of 16cm is perfectly suited for wider handle bars. The high tech rubber is very comfortable. Due to the structure of the grips, sweating is kept to a minimum, providing you with a good grip in all situations. In addition, the handles have very good shock absorbing characteristics, that will help you to do higher jumps without hurting your hands. 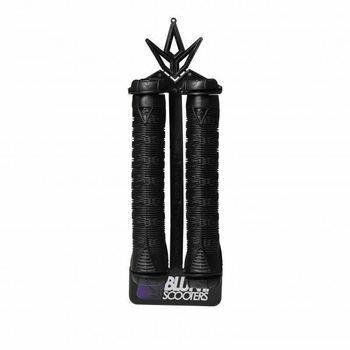 We are sure, the new V2 Blunt hand grips are the best ones on the market at this moment! Schöne Griffe, Stopfen sind auch dabei, was will man dazu weiter sagen. Alles ist bestens. Wir montieren immer mit Haarspray, ggf. noch kürzen nach Bedarf.